July found me at a shopping centre searching the stores for a bargain bin full of unused 2018 diaries. My head had been spinning for a few days with ideas for this blog, future posts I wanted to write, plugins to research, and collaborators I wanted to contact. I also have to remember when to switch certain features on and off for giveaways, and when to notify our sponsors that various blog posts are up. That didn’t leave much room in my head for my personal life. When we finally start the building process I’ll have even more to remember in regards to sourcing materials and following up on orders. Therefore, my conclusion was that a diary would be useful. The shopping centre hunt was unsurprisingly unsuccessful. However, I did decide it was probably a good idea to start planning for 2019 and so I sent out a couple of requests on various Facebook groups to which I belong, looking for diary suppliers. The response was pretty unanimous – The Papery! So, it’s time for a Papery Review. It wasn’t long before Alison Deary, from The Papery, saw my post and contacted me too. She kindly took the time to answer my questions I had regarding her various diary options (although most of the information is on her website), while I explained to her my needs for a diary. Her recommendation was the Multiplanner. It is a weekly diary, suitable for any year, which meant that I could begin using it the day it arrived! By now I was pretty excited (awesome new stationery is always exciting), and I placed my order. Alison was also very supportive of our container house project, and what we are trying to achieve. She arranged to send me a second Multiplanner for one of our readers to win. I impatiently waited for the parcel to arrive. I was very much looking forward to having all the aspects of my multifaceted life in order. Alison has a range of diaries and I have had the opportunity to check out her MOM diary too. The MOM and WOW diaries have been formulated to help women keep on top of their home and work responsibilities, as well as care for their own well-being. They include 12 full-colour recipes that the whole family will enjoy ( the Thai style lamb shanks is on my to-cook list), as well as some other cool features such as schedules for extra-curricular activities, first aid info, and lots more. My challenge: Review a diary without giving away any secrets on upcoming blog articles. Solution: Photographs of blank pages. Alison began printing diaries after she realized that she couldn’t find a diary she was satisfied with. Her goal was to produce the perfect diary to help run her home, personal life and business life. I think she met her goal because I was very impressed with the Multiplanner, just one of her range. My first impression was how light it is. The Multiplanner is quite big, being A5 in size and thicker than the average diary. For something that big, I was expecting it to be quite heavy but was pleasantly surprised by the airy feel of the diary. This is a huge bonus when carrying the diary around with you on your daily errands. 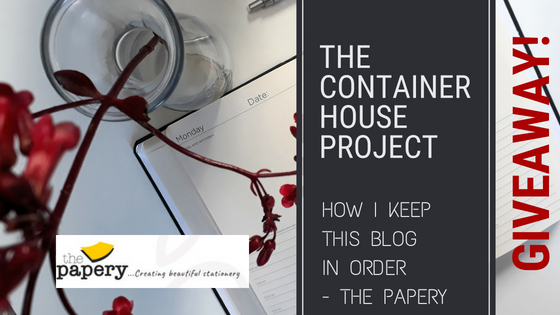 – Awesome for planning future blog posts as you can easily see in which order you will release each new article. – Perfect for taking notes at workshops, events, and expos. House Project: Material sourcing, supplier & delivery follow-ups, etc. Home Life: When to buy pet food, send in laundry, etc. – And yet still a difficult decision. They’re all so awesome! – I like cream paper; it’s not so harsh on the eyes, especially if you have to take notes while standing outside for any reason. Excellent choice for a planner. If you’re a creative person, you can draw your reminders and/or ideas instead of writing them down. See points 10 & 11 above. If you can’t wait to see if you have won your very own Multiplanner from The Papery, you can order yours online. Find their contact details here. Guys and girls! Stand a chance to win your very own Multiplanner! Remember, you can start using the Multiplanner whenever you want as it is not year specific. We’re running this giveaway a little differently. Earn extra entries for every friend you refer, so get sharing! Next post: Building Plans Approved! What’s Next? Yay for keeping your life in order – and so stylishly! That diary will be full before long!